Do you want to see God do amazing things in the hearts and lives of your children. This journal will guide you through 35 days of reading, praying, and writing Scripture prayers regarding their growth in Godliness and Godly character. Make the commitment to pray daily for your children and watch God work. There is nothing more powerful in your parenting than prayer! By praying Scripture for our children, we invite the very power of God into their hearts and lives. 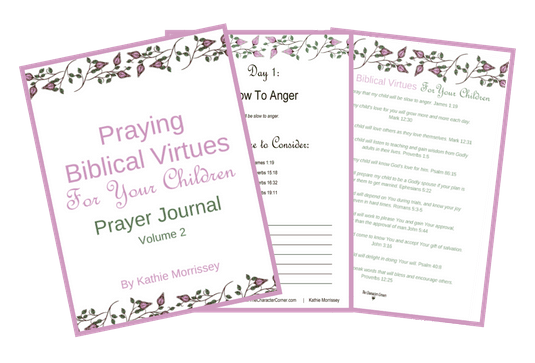 This printable journal is a follow- up to the Praying Biblical Virtues For Your Children Volume 1 Journal and will continue to help you pray powerful Scripture prayers for your children’s character. 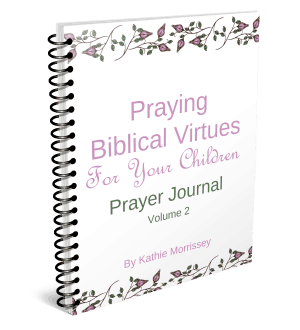 This is an excellent tool to guide you and keep you encouraged as you not only train your kids in Godly character but also PRAY for their character using powerful Bible prayers. Praying Scripture changes hearts and lives, and there is no greater investment you can make into the lives of your children! This is a downloadable file which you can print in color or black & white.